Our collapsible A-Frames are a lightweight, portable and convenient indoor or outdoor display. 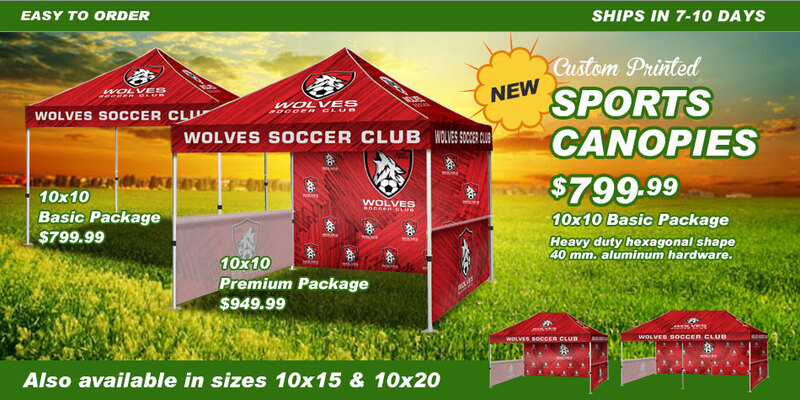 They offer instant visibility, and the modular frame comes with a convenient storage bag, making them excellent for sporting events, promotions, trade shows, and directional signage. Make your fields stand out with tour custom team, sponsor or tournament logos on our custom printed 13" x 13" Corner Flags. Best of all, out flags will fit over your existing flags and poles! Just roll your existing flag and slip our flag over it ans secure with the provided clip. Our durable and lightweight weather-resistant polyester fabric creates a vibrant flag that flows beautifully in the wind. Custom printed single sided dye sublimation technology, your image is viewable from both sides, with the back side being reversed or mirrored. • Ships Standard UPS Ground - No oversize fees to worry about. Our Wind Drop (also known as a Tear Drop Flag) is a definite eye-catcher out on the field. A drop-shape curved pole pocket keeps your flag on full display with or without a breeze. Our Wind Blade (also known as a Bow Flag) is the most popular product on the field. A blade design with a curved pole pocket keeps your flag on display with or without a breeze. Yard signs are a classic messaging tool for any event that needs to be noticed. These are the drive-by attention-getters that are economical and easy to set up and take down. Yard Signs are available in single sided or double sided. The public is aware that these signs mean something is happening NOW. Well placed signs can help make your event a major success.